Happy Monday guys! Since this week is Valentine’s Day, I thought it would de fun to do a themed week and talk about all things V-Day related: Love, relationships… And Valentine’s Day themed nails. Although I’m really not the type to go full-out with Holiday-themed outfits (I wore a bikini for Christmas, lol), I do really enjoy a cheeky nod to a Holiday with my manicures… So today, we’re talking about this GORGEOUS sparkly nail polish from Urban Outfitters… And we’re spicing sh*t up with some super cute and edgy metallic temporary tattoos. So first I feel like I need to talk about this nail polish a little more. It’s from Urban Outfitters, which might sound a little surprising to anyone who knows me IRL, because for the last 5 years, I’ve been saying to whoever wants to hear it that I will never put anything else other than Essie Gel Couture on my nails. Well… Times have changed. No shade thrown at Essie, I’m still a massive fan of their nail polish. My only complaint really, is that I LOVE a sparkly nail. In all honesty, I’m a glitter whore. I love anything glittery, holographic, duo-chrome… Basically anything the 12 year olds are going nuts for, I’M IN! 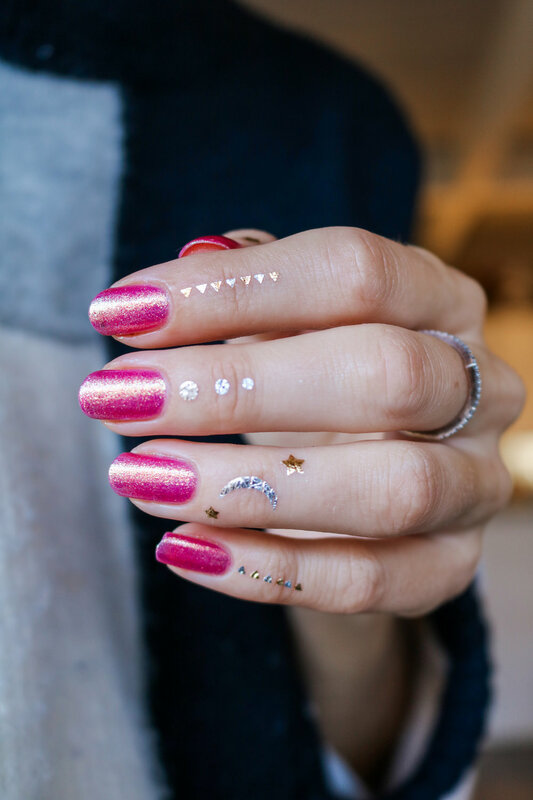 As I mentioned in my post about holographic glitter nails, I was at Urban Outfitters in December last year, when a holographic nail polish jumped at my face and begged me to try it. I was actually super impressed with the quality, so I went back earlier this year and bought 3 more. And let me just say, I’m probably going to stock up on some more options. First of all, they’re usually $5 each, but they often have promotions where they’re 3 for $10. In both cases, that’s an amazing price for nail polish. But what’s even more amazing is that contrary to most other affordable nail polishes, they’re SUCH high quality. I’ve been wearing this pink mani for more than a week before the first chip happened. I have been wearing it with my Essie Millionails base coat and my Essie Gel Couture top coat (linked below), but I feel like this pink sparkly UO nail polish lasted even longer than the Essie Gel Couture polish I would normally pair with these. My guess is that glitter nail polish is much grittier, which also makes it more chip-resistant, but no matter what the reason is, this Urban Outfitters nail polish has really won my heart, so expect to be seeing it on here a lot more. While we’re on the subject of glitter nail polish, I feel like I also need to mention something here: This nail polish definitely packs a lot of glitter, but it’s remarkably easy to take off. I usually loathe taking off glittery nail polish because it just goes through my cotton pad like a very aggressive sand paper… Not this one. I was actually super astonished at how quickly it came off. Literally, there’s no downside to this nail polish. The one I’m wearing in these pictures is called Damsel, and as you can see, it’s a super pretty pink with very sparkly gold glitter. It’s just STUNNING and super girly and playful, which I love. Since I didn’t want to mess this beautiful colour with a nail art, I decided to just wear it on its own. Since I still wanted to add an interesting element to my nails, I decided to (finally!) use these super cute metallic temporary tattoos that I got YEARS ago for a music festival and then forgot about. I feel like finger tattoos are SO cute, but quite a big commitment, because unless you want to wear gloves at all times, they’re pretty damn hard to hide. I personally have 2 tattoos, but they’re on my ribs, so unless I’m in a bikini, you can’t see them. I don’t know if I’d be ballsy enough to get an actual tatt on one of my fingers, but I love the idea. So it goes without saying that I had so much fun putting these on and rocking them for the day. I wanted to go a little extra with a different tattoo on each finger, but for a more subdued look, you could also do just one or two tattoos on on or two fingers, and I feel like that still be appropriate, unless you work in a super corporate environment. I linked a metallic temporary tattoo kit below, and it’s $5, which seems to be an amazing price. I feel like I might get it myself, just because I really loved the look of it, and I ran out of mine. The set I used was from years ago, as I said, so they were a little old and I had to throw out a bunch of them. I also feel like this look would be super cool or a music festival, where more is always more! What do you guys think? DO you love this bright pink and sparkly nail polish? Do you think it’s on-brand for V-Day? 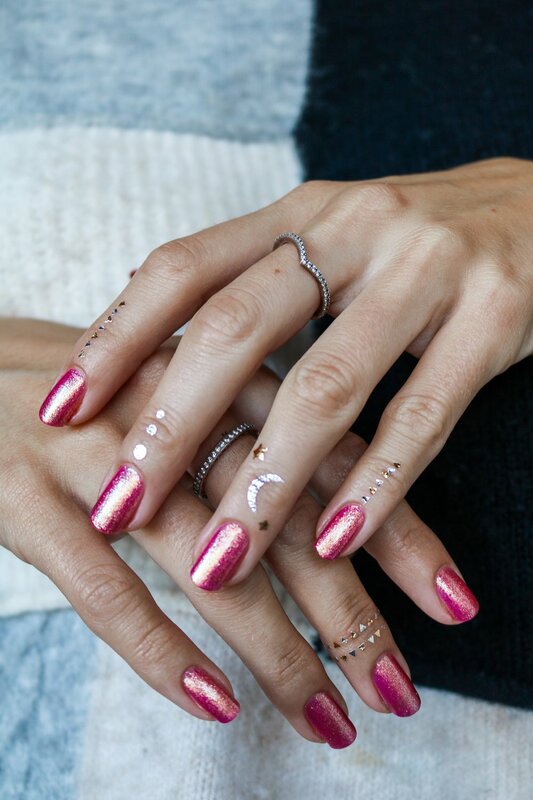 And would you wear metallic temporary tattoos? I personally feel like they’re SO COOL, so once again, get ready to see a lot more of them on here, ha!